On July 6th 2018, for the 10th year anniversary of Moegyo Humanitarian Foundation (MHF), we collaborated with volunteers from the “Noodle for Knowledge Project” and travelled to Hinthada in the Irrawaddy Division, an approximately 5 hour drive from Yangon, Myanmar, to take part in a grand ceremony organized by one of the four schools in the town that had received a computer. “Noodle for Knowledge Project” helped raised funds for donation of five computers. Having received their first computer, the school was immensely grateful and the appreciation and excitement from the children and community were overwhelming as gratitude was expressed through dance performances by the children and speeches by the officials from the town. While the initial segment of the event was the official ceremony for the reception of the computers, the following was our Moegyo Youth presentation to the children. In our presentation, we shared our personal experience with computers and the significant role technology had maintained in our education. Additionally, we addressed the available tools and applications the children now had access to, and their promise to an easier approach to learning. The kids stirred with excitement at the animated GIFs and transitions in the presentation, and were delighted to see the myriad of games stored in the computer as they crowded around the screen and rushed to raise their hands to take part. As we concluded our presentation, we distributed notebooks and pencils to allow the children to write down their questions, what they would like to further learn about the computers and how they would use them in the future. It was a fulfilling experience to share our knowledge and share the excitement of children for receiving their first computer. Thank you to the volunteers and donors of the “Noodle for Knowledge Project”, and this opportunity for the MHF youth program. Volunteers from Moegyo Humanitarian Foundation collaborated with Oogie Art https://www.facebook.com/OogieArt/ in New York City to bring Myanmar Leadership program to Mya Theingi Nunnery in Mingalardon township in Yangon. During three day long program, about 180 art enthusiastic children from all grades at the nunnery had a chance to learn creating art pieces using different medias and materials. 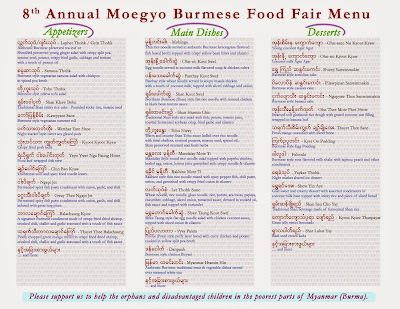 We regret to announce that the annual Moegyo Burmese Food Fair that typically falls on the second Sunday of June is postponed until further notice. Fortunately, with your donations, we are able to continue following support programs for 2016 - 2017 school year that are beneficial for less fortunate children in the poorest parts of Myanmar. a. Provide salary for six educators and staff to educate over two hundred Ta-Ann (Palaung) children at the school. b. School clinic opened and staffed with a recently certified nurse. c. We are in the process of obtaining secondary school status to be able to enroll the students who completed primary education. a. Provide monthly support for basic needs of children at Kani Parahita. b. Continue the educational support program that provides salary for educators who help the students taking college entry exams. The program is highly beneficial to Kani village high school and helped achieve the highest passing rate in the township for past two school years. c. Continue providing scholarships for students who passed college entry exams and are continuing on to college. The school currently has 24 college students who are receiving Moegyo Scholarships. With help of Moegyo educational support programs, the school so far produced a Defense Services Academy graduate, a Police Academy graduate and four University of Distance Education graduates. a. Provide monthly support for basic needs of girls at the orphanage. b. Continue educational support program that provides salary for educators who help the students taking college entry exams. With help of Meogyo educational support program, three girls passed the college entry exam and are continuing to go on to college. c. Continue providing scholarships for three college students. a. Provide monthly support for basic needs of children at the nunnery. b. Continue educational support program that started last year which provides salary for educators who help the students taking college entry exams. a. Provide monthly support for basic needs of the children at the orphanage. Due to the orphanage being located remotely at the edge of river with no access to roadways, the children are always in need of basic support such as food and clothing. We appreciate your continued support. We couldn't have achieved all the above without you. Please go to http://www.moegyo.org/donate to send in donation and keep an eye on our website and Facebook pages for future events. #SupportMyanmar - Please help the natural disaster victims in the country. On Monday, 3 August, 2015, we will begin making transfers to the groups already in the field helping the natural disaster victims, namely Daw Khin Kyi Foundation and Wai Lu Kyaw Foundation. We are also in touch with other groups who are heading to disaster areas. Please click on the "Donate Now" button if you wish to send donations. Thank you so much! Approximately 156,000 people were affected by flood throughout the country, particularly in Sagaing Region, and Kachin and Shan States. Flooding have also been reported in upper Rakhine, lower Chin and Kayin States. Myanmar’s Relief and Resettlement Department (RRD) reported 27 death due to the incident. After visiting the affected sites, on 31 July, President Thein Sein issued a statement declaring natural disaster zones in Chin and Rakhine States and Sagaing and Wagway Regions. Local authorities, ministries and departements, military and police as well as local and International NGOs are responding to the situation to provide assistance. Based on the Myanmar’s Meteorology and Hydrometeorology Department, above normal rains are expected to happen in the next days in Bago Region, Kachin, Shan, Rakhine, Kayin and Mon States. We visited Kani Orphanage at the Kani Village which is about a 30 min boat ride from Pyapon in the Ayeyarwady Division which is a 3-4 hour drive away from Yangon in south western Myanmar. We also visited Pyinnyar Waddy Orphange in Kyite Latt on the way back. Moegyo (MHF) has been providing monthly support to both orphanages since the Cyclone Nargis in 2008. As soon as we reached Pyapon, heavy rain started and continued throughout our boat ride and throughout the most of the day. On the small boat, under the heavy rain, I thought about the cyclone that passed through this area 8 years ago, which took many lives and left many orphans. We passed by villages with small huts, which stood in the water. When we reached Kani, the members of the board that run the orphanage and the teachers there, warmly welcomed us and showed us around, particularly the high school, that just opened this year, which MHF provided support. Before this, children had to walk 2-3 hours round trip daily to a nearby village to attend high school. We also met 16 students who just passed high school this year. All said they would like to continue the studies at colleges. College tuition (distant learning) is around $120-$150 per year for each student and required for 4 years to graduate. Teachers and the board repeatedly expressed their gratitude to the donors and volunteers at MHF for the support for the construction of the high school and for the tuition of the high school students. They proudly explained the growing record of high school graduates. Kani has more than 500 students, of which about 160 are under the care of Parahita (the orphanage). Currently, there are 24 college students receiving scholarship from MHF. On the way back, we visited the girls orphanage at Kyite Latt, which is a two hour drive from Pyapon. As soon as we entered the compound, we saw big posters of 3 high school graduates, hung outside the orphanage. We met little ones from the age as young as 3-4. Everyone was happy and proud for the graduates, who are now the models for the little ones. The passing record is 100%. We also met one college graduate who returned to the nunnery to take care of the children. Our heart was with these girls since one of the MHF volunteers reported the condition of this nunnery 7 years ago. Monthly support from MHF has relieved some expenses on daily meals and tuition. The nunnery is now hosting 35 girls. We asked what they needed and were told they needed clothes for the little ones and the little ones also asked for toys. We brought workbooks, pens, pencils, soccer balls, snacks, magazines and journals, and some used clothes for the children and also handed the award from MHF to high school graduates in both orphanages. It was a mixed feeling we felt: sad for the children in the unfortunate circumstances and happy for their hopeful faces. We want to thank the donors and volunteers of MHF for the continued support and for making a difference in the lives of the children. By Train: 7 train to 33rd St / Rawson St Station on Queens Blvd. Follow the event updates on Facebook. With your support and donations, Moegyo Humanitarian Foundation is able to continue with the following activities and projects in 2014. 1. Moegyo Humanitarian Foundation donated US$1,000 to 3hird Medium (3M) in New York for their efforts in providing support for orphans and orphanages in Myanmar. 3. In addition to providing tutoring support for high school students who are taking university entry exams since June 2008 school year, Moegyo continues to provide scholarship of about $120 for each university and college student at Kani village and Kyite Latt. There are 26 university and college students currently receiving Moegyo scholarship for 2014-15 school year. 4. Continues providing monthly salaries of US$100 each for 9 teachers and US$80 for a maintenance personal at the Moegyo (1) Primary School in Panthapyay village near Lashio, Shan State, Myanmar. 5. 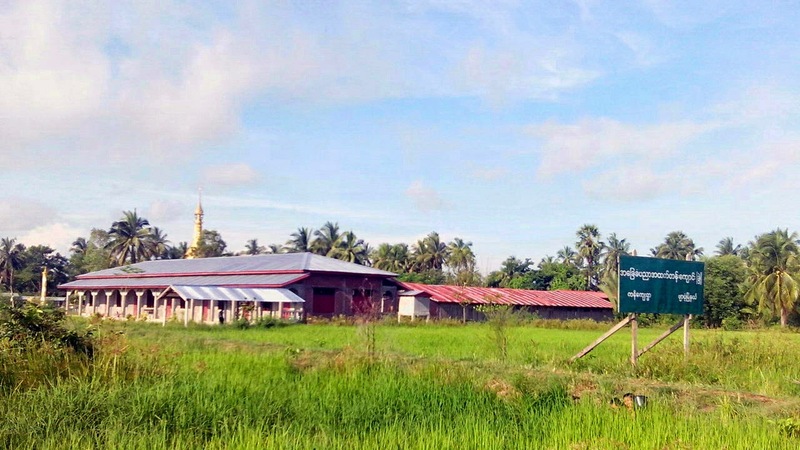 Enables a construction project of a new High School building at Kani Village in Pyapon Township in Irrawaddy Division. So far, Moegyo was able to send over US$34,000 to fulfill the proposed construction project budget of US $40,000. See the photos of the new high school building near completion. 6. Due to the increasing numbers of students at Moegyo (1) Primary School in Panthapyay village in Lashio Township, Shan State, Myanmar, MHF is adding more classrooms, toilets and living quarters for the teachers. The foundation has funded the initial amount of US$20,000 for the project to start. Combined with construction and logistics cost, MHF estimated US$40,000 in total for the whole project and estimated to be completed by the late spring of 2015. The project manager from MHF is currently at the area overseeing the activities of the project. 7. Moegyo donated $10,000 to Myanmar Book Aid & Preservation Foundation in Myanmar to cover the logistics cost to send about 50,000 books full of container to the people of Myanmar from the United States. 8. The 7th Annual Moegyo Burmese Food Fair was held in Queens, New York on Sunday June 8th, 2014 and raised over $25,000 combined with donations. 9. 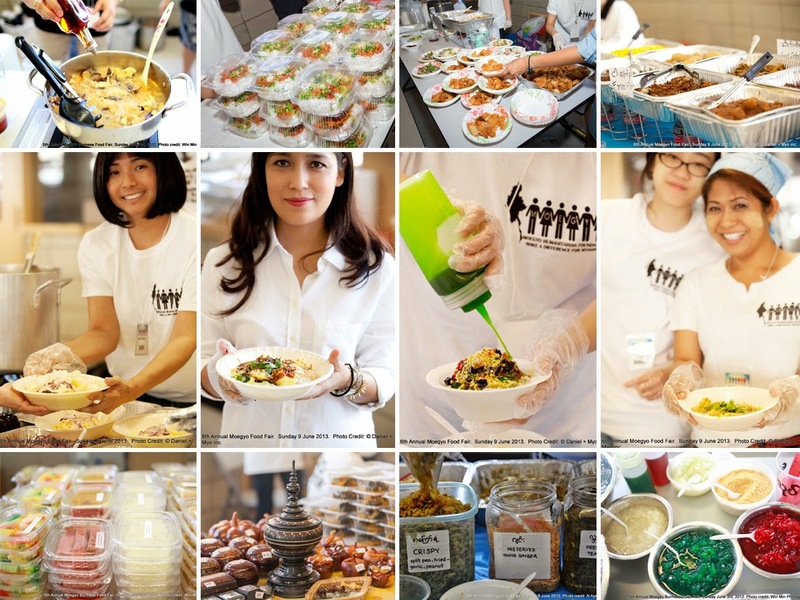 On Sunday November 16, 2014, the first South Florida Burmese Food Fair was organized by Moegyo volunteers at Welcome Oriental Food Market at 1282 NW Federal Hwy, Stuart, in South Florida. All this would not have been possible without your generosity, continued support and dedication. 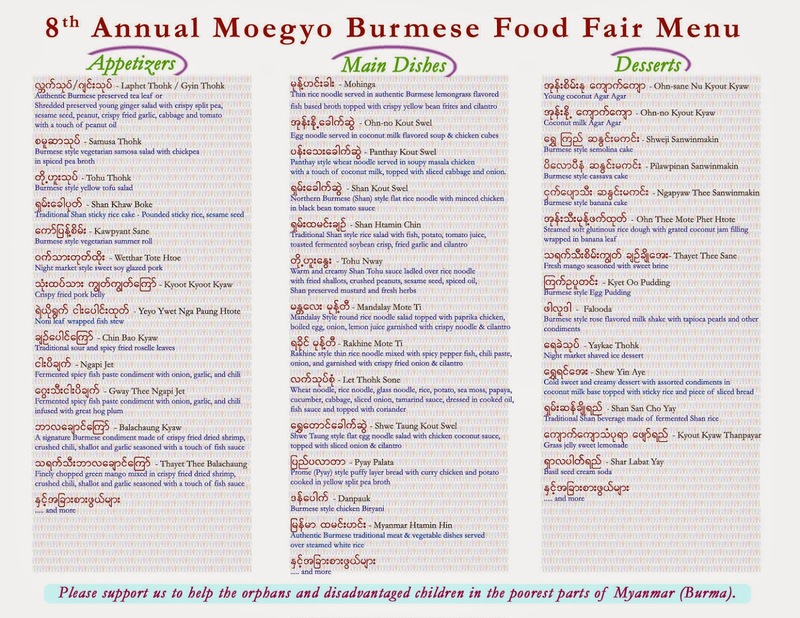 See the 7th Annual Moegyo Burmese Food Fair Menu. 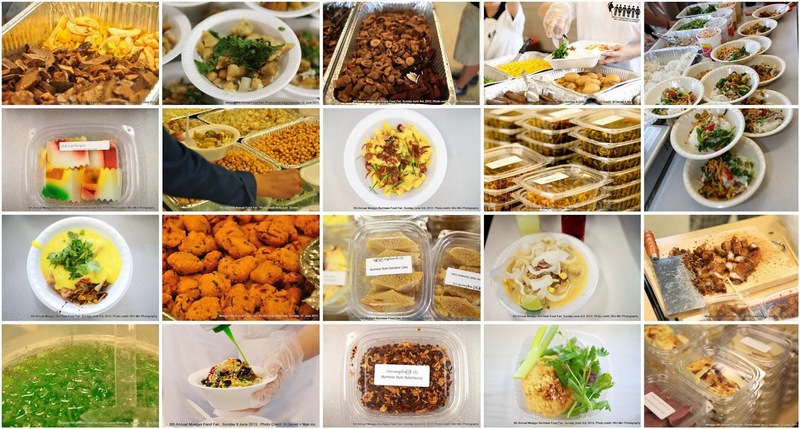 See the photos of 6th Annual Burmese food fair from last year. Dave of Eating in Translation said, "I arrived 15 minutes before the scheduled starting time and found the joint already jumping.". 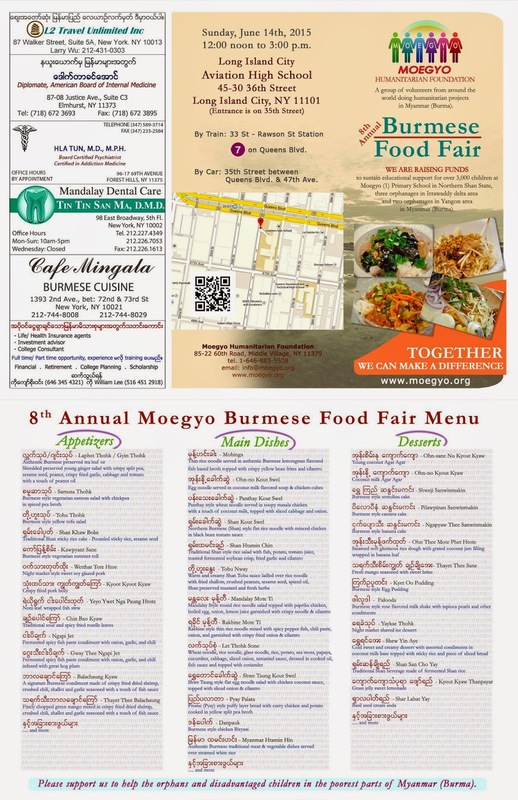 Meg Cotner mentions Meogyo Burmese Food Fair as "the most anticipated food festivals in Queens" in the book "Food Lovers' Guide to Queens". James Boo of the Eaten Path calls it, "a smörgåsbord of home-cooked Burmese food that joyously undoes New York’s lack of Burmese restaurants for one delicious day in Queens". Joe DiStefano of Chopsticks + Marrow calls it, "the grandaddy of them all Burmese food festivals". Liz of GlobalAsianCulture.com said, "I just had the most amazing bowl of noodles in a long, long time.". Max Falkowitz of Serious Eats said, "lots of brothy noodles, salads with unexpected nuts, stewed meats, and slurpable desserts". William of Edible Queens said, "Burmese food is just as amazing as I remember it." Corey Reis of Marhaba Wa Aloha said, "As you don't often find Burmese food in Manhattan, I was looking forward to trying a new type of cuisine.". 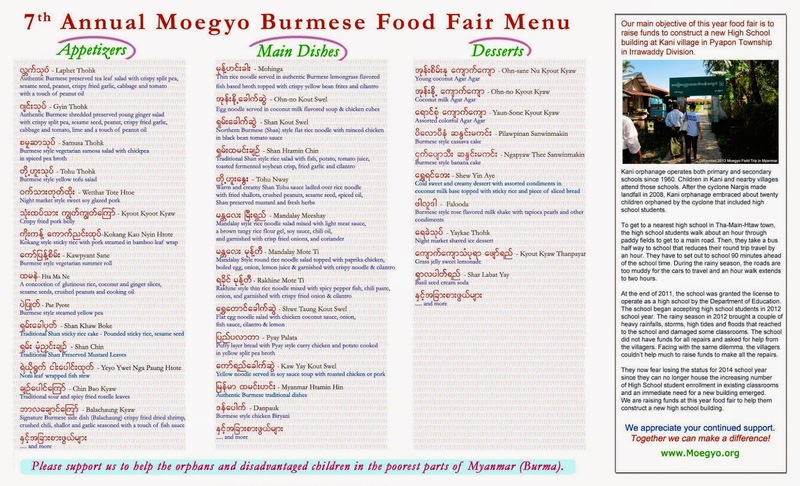 Wendy Wong of Real Cheap Eats NYC said, "I got an excellent introduction to the cuisine at the Moegyo Humanitarian Foundation’s annual Burmese Food Fair in Long Island City, Queens." Myanmar Book Aid & Preservation Foundation in Myanmar partnered with the Nargis Library Recovery in the United States has been working in rebuilding libraries and providing books to the people of Myanmar (Burma) since 2001. In 2013, it partnered with Daw Khin Kyi Foundation and Beyond Access to acquire and distribute books to the public libraries, schools libraries and universities across Myanmar. The process of shipping and distribution of 1,000,000 (a million) books donated by Thrift Books in the United States has begun in the late 2103 and expected to be completed by the end of 2014. Moegyo Humanitarian Foundation is grateful to be able to provide the logistics cost to deliver a 40 foot container full of over 50,000 (fifty thousand) books from the United States to the people of Myanmar.